What is the Chicago Architecture Foundation and what do you do there? The Chicago Architecture Foundation is like a museum, but instead of having a collection of artifacts on the insides of our walls, the collection is the buildings of Chicago and the stories of those buildings. Our mission is about helping people understand why design matters in their lives. We’re very well known for our tours. We’re famous for the Architecture River Cruise on the Chicago River. In addition to tours and exhibits, we do public programs. We work with young people, which has been increasingly focused on thinking about how to use the built environment to have them think about the role of decisions and places and the kinds of places that they want to live in. I’ve been the Vice President for Education and Experience for almost three years. My day to day life is about working with a team to design all of our programs for ages 3-18, and create curriculum for teachers. When I put my leadership hat on, a lot of what I focus on is thinking about how to position CAF as not just a leader in design education but really thinking about how are we as a cultural resource doing relevant work for the city. That leads me to my next question, which is, why did you make a graphic novel? My background is in social justice activism. When I took this position, a big part of the appeal and the challenge for me personally was thinking about how to connect this great organization to the day-to-day issues in people’s lives in Chicago. That’s my personal philosophical framework. The nuts and bolts is that it was the CAF’s 50th anniversary and our CEO was asking around for ideas about what we could do as a legacy project. 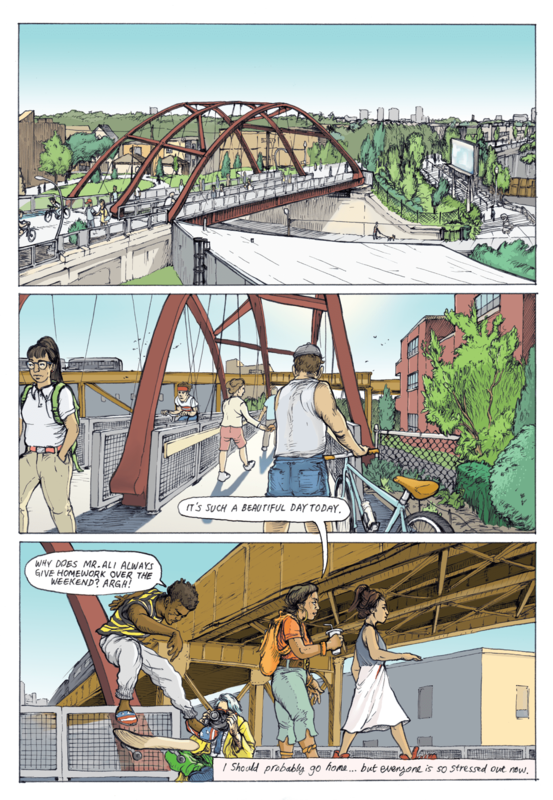 I suggested that we reinvent Wacker’s Manual, which is a 1911 textbook, as a graphic novel. Wacker’s Manual is the kids version of a very famous document called the Plan for Chicago. If you’re in Chicago, or you’re into architecture or cities, then you’ve heard of this thing. It was developed by Daniel Burnham, and it was commissioned by this business community here who was very concerned that Chicago in the aftermath of this fire was growing so fast that it was very difficult to organize the city. The plan of Chicago mapped growth and development of Chicago, and we still live with the residuals of that plan today – including having a lakefront where there are no buildings right on the lakefront, give or take. What a lot of people don’t know is that part of the propaganda strategy for the Burnham plan was to create a textbook and have all eighth graders read it before they graduated school. Wacker’s Manual became mandatory reading, and it’s this wonderful urban planning treatise that says these are the building blocks of the city and your city will only be great through your united civic efforts. That was the gist of it. That’s part of Chicago’s history and legacy and the DNA of the city. The idea that we might reinvent that for the 21st Century was one part of the idea. The second part of the idea, that it would be a graphic novel, I couldn’t have been happier that people embraced it because I’m a big fan. I grew up reading comics, and it’s just perfect for the subject matter. 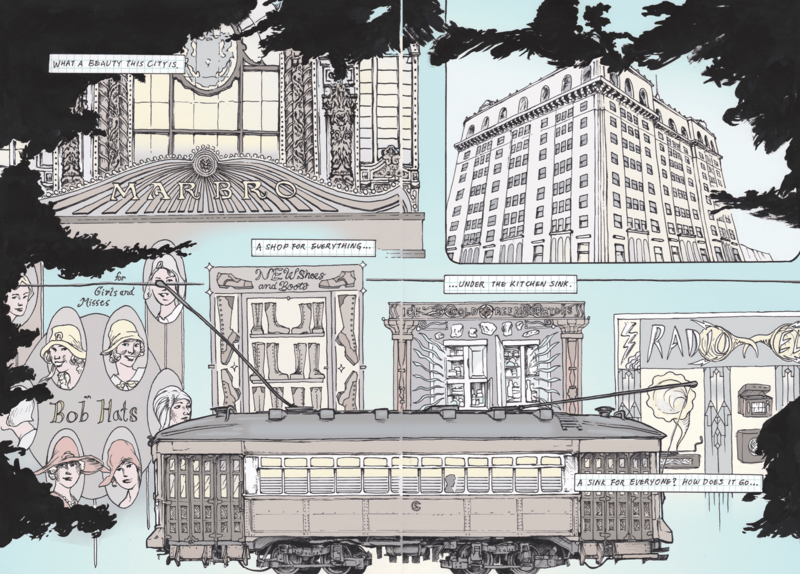 It was such a beautiful match as a genre for depicting architecture and places and the metaphors in architecture. Those carry political and philosophical weight, so the genre was just perfect. People really embraced the idea and got very excited about it very quickly. That’s what so interesting about Wacker’s Manual because it presents democracy as something to which we all contribute and play a role. The progressive of the early 1900s really thought in terms of the metaphor of a city being like a person. The idea that the city will only be great because the people who live here work together to make it that way. It’s very romantic, but it has some very practical effects for people. Not just that people understood the nuts and bolts of cities – things like infrastructure and roads and water and rail and transport and green space – but also just this idea that we’re in it together. So you started with this idea of making a graphic novel. How did you come up with this concept of three stories set in three different time periods? Once we had the idea, we spent about nine months developing a design brief. What I really wanted to have clarity on was what was most worth knowing and experiencing in terms of urban planning and civic engagement. I thought that having that clarity on the themes and the pieces and all the ingredients was going to be critical for a couple of reasons. 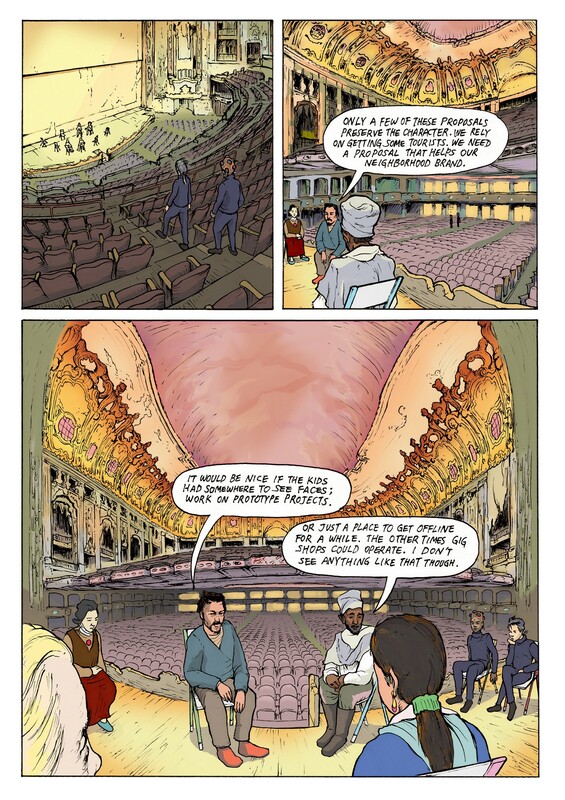 The primary goal was to create a really great graphic novel, a contribution to the genre. That was a personal goal of mine. 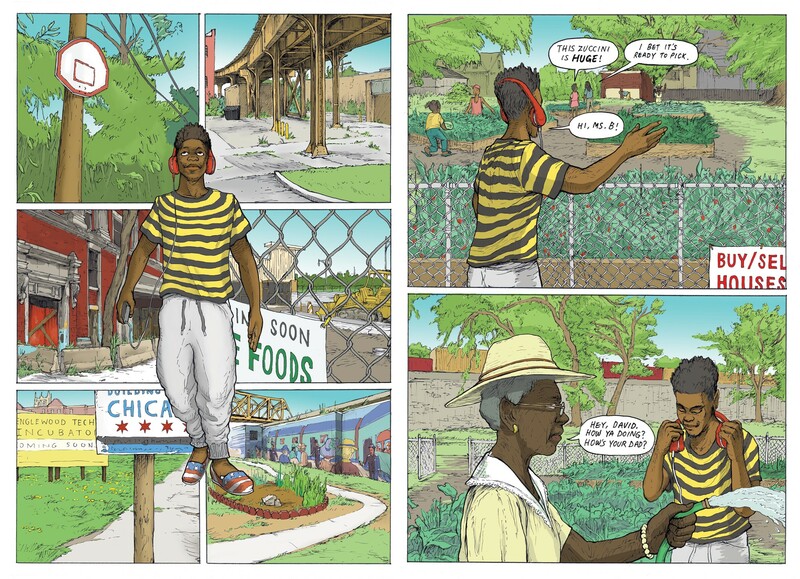 But the institutional goal was to use this graphic novel and really embed it in the city education fabric. That meant we had to really be clear on the content, what were some of the themes, how does it fit into curriculum – and most of all, how was this possibly a tool at helping close this civic education gap. There’s a real social issue around who has access to social education. Nine months was spent developing the design brief and then we announced a commission and the commission looked for submissions from Midwest artists. We were looking for artists to send us examples of their work and concepts addressing four things: Chicago’s past, present and future. Architecture as a character. Young people having agency. Grit and shine. I think we had 28 or 30 entries from extraordinarily talented people. Students helped us jury the entries and we had a professional advisory committee that helped us jury entries. We interviewed five finalists, and the group we selected Eyes of the Cat, an artists collective. Part of their concept was that rather than doing a single novel with one storyline that there be three chapters set in the past, the present and the future. They came in with an outline of a story for the past that’s pretty close to the story we ended up writing together. They’re an extraordinary talented group of people. The five of us did a couple of things together right away. We established a very rigorous schedule. We were meeting together as a team for two to three hours on a weekly basis. I brought in people to do briefings for us – we had a futurist come in, we got some Chicago historians, we got the nuts and bolts of planning, we had a critical educator. Then we went into story development mode and each chapter had its own challenges. There was a ton of research. There was a ton of work on reference images and concepts. One of the things that I liked about the book was how it portrayed the city as this complicated jumble of interests and people. I think we’ve all heard the story of, the city used to be great but then something happened and everything went to hell. You show that the challenges and problems today are not new and won’t go away anytime soon. I think that’s right. There’s a couple of things embedded in No Small Plans that are related to that. From an educational standpoint, it’s really a curriculum of questions. I think we were very clear from the outset that the experience of young people having adventures in the city is complicated. This isn’t kids save the day. It’s not superheroes. It’s that all of us are being and becoming and interacting with the world and young people have tremendous agency. The idea that they’re full people that they have agenda that they’re interacting. They wrestle day to day with these things we still wrestle with today – and they’ve probably always been around. Who is the city really for? How do decisions get made? What is my role and my responsibility? These things are really complicated. What we wanted to demonstrate through the images and through the characters is that change is always happening and that the city is changing. The other thing is that the more things change the more things stay the same. The segregation in chapter one of who belongs where and why, in chapter three which is set in 2211, the city is still segregated. They’re still wrestling with issues of political power and control and access. That is ever-present – because we’re human. I found the future story so contemporary, and I’m sure many others do, too, because it’s about how developers want to build more condos and the community wants a different approach to development. That’s the story of so many communities – and will continue to be. For me each chapter had its own pleasures and challenges. We did two other versions of Chapter Three that made it to the dustbin. What you’re reading is literally the third version of chapter three. One of the things I was excited to do was take what people think and know about what will happen to cities as we’re an increasingly urban world and come up with a way to present that. By 2050 – by the time teenagers who are reading this will be adults – three quarters of the population of the world is going to be living in cities. The United States is not going to see first hand these massive urban transformations that are happening in other parts of the world, but there are some things that are true – especially for us and especially in postindustrial cities. This issue of transportation and how transportation fits into the fabric of how people live is going to be huge. The issue of housing. These are subtle things but Tang and Codex’s apartments are micro-apartments. We tried to things like suggesting that in the future lighting is going to help people live in these very small, otherwise austere spaces. Codex is such an analog lover and wants to get off the grid and she’s in an itty-bitty place, so the spaces are multi-functional. We spent a lot of time with the nuts and bolts of the future and architecture. It sounds like the future was the hardest part of the book. What was hard about the future was the story. One version of the story was about the role of VR and where they play a game and the different versions of the game give you different cities, but there was no tension in that. Then we came up with this idea that well what if what Wacker’s Manual really says that you’ll be future heads of households, what if we make that reality? What if we say they have to make a decision that’s their responsibility – literally – to decide what gets built. And then things started to fall into place. We were excited presenting technology and presenting how young people might be networked. The future is gritty without being wholly dystopian. We were interested in how could we present that around a real storyline. I think that’s always the tension. You can fall in love with the images, but no matter how driven you want to be by the images, you still need a storyline to hang your hat on. Obviously. [laughs] That was the struggle with chapter three. We had all these fun ideas where we could play with the medium but they didn’t end up working in the story. Talk a little about Chapter Two, which is set in the present. 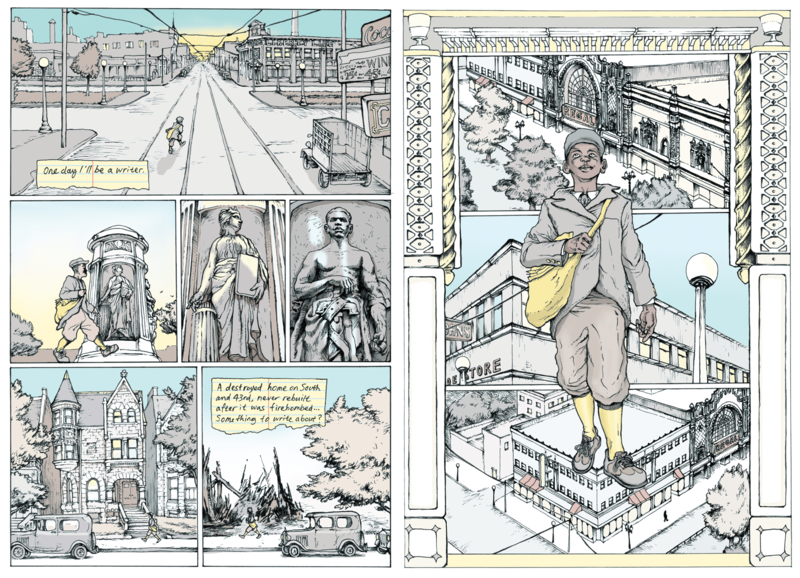 It opens in a classroom and then it follows the students into their neighborhood where they see how these lessons about history and the city are playing out. I love the way the chapter came together. We talked about what are the issues that are happening right now. We knew we wanted to focus on this issue of displacement and the relationship between displacement and development. We knew there was going to be a girl named Natalie who found out she was being displaced and she was friends with this cast of characters who had different ways of relating to that information. Her friend Christina is very politicized and that gave us a chance to tap into existing history here in Chicago. The neighborhood has a recent history of fighting against a coal plant. Then her friend Jesse just moved into the neighborhood and that sincere lack of awareness. A lot of people have that. They move in and they love their neighborhood but they don’t understand the implications of those choices. Then you have David who lives in the neighborhood, which by the end he sees as being poised for some of that transformation. Those were all the pieces and then the chance to set it in the classroom made a lot of sense. The Magic Schoolbus is something that I love. Those first books when they came out were a revelation because you saw lots of different kids having conversations while the teacher is talking and so we wanted to give a nod to that. We wanted to touch on other things like the role of photography and seeing through the lens. The hard part was knowing where to put the tension, if that makes sense. At first you didn’t find out that Natalie was being displaced until midway through and I think things really fell into place when we moved that information right up to essentially the first page. There’s no period where she knows something and the readers don’t and then a lot of other things also fell into place for that chapter. One of the challenges of Chapter Two, given that it is being underwritten by the Chicago Architecture Foundation, was how to make sure that that chapter is complicated and it’s not just down with developers up with the people. Going back to the question you asked earlier, chapter two was about making sure that the complexity of how the characters ideas are changing is built into the DNA of that chapter. David’s dad is a developer and he raises the point that sometimes people have been holding onto properties for a long time. Or in the case of Jesse, how do you move into a community where you show up and you’re the new kid on the block – literally. He starts out taking pictures of funny dogs and by the end he’s thinking about how to take pictures of Natalie’s neighbors. Trying to figure out how to wrestle with something that really is complicated was a big piece of that. To keep it complicated and not to lean towards oversimplifying. You mentioned that the plan was to use this as an educational tool. How is it being used by CAF and others? We’ve given away almost 6,000 copies of the book to Chicago teens, and in the upcoming year we’ll give away another 10,000 to 12,000. The map education initiative, which is called “Meet Your City,” is operating in three ways. One, some teens are just getting the book, and they read it and that’s great. What we’ve heard from them is that they like it and they’re giving it to their friends and their siblings, so one piece of this is just to create a good read and get it into kids’ hands. Hopefully they relate and look around themselves in a new way. The second thing is we have a really strong partnership with the Chicago Public Library and Chicago Public Schools. On a quarterly basis now, we are doing training with teachers who get classroom sets, and those teachers and librarians are using it in their curriculum. The third piece is that organizations are reaching out to us. Community development organizations, for example, like the LISC [Local Initiatives Support Corporation], because they want to use it with students and then sometimes more robust partnerships happen. There’s some amazing things that happen with these books being used as a kind of catalyst. To give you two examples, there’s a teacher who works in the far South side of Chicago in a part of the city that is very industrialized. It’s where the city’s primary steel mills were, and one of those steel mills has been closed, and there’s a huge piece of land that will be developed. The teacher had all sixth graders read No Small Plans, and they’re developing proposals for what should happen to that old steel mill site. They’re not just developing them in a vacuum. They’ve been meeting with their alderman. She took them on a tour of the site, and they will be presenting their proposals in January. Another example is that there’s a library in Englewood where the librarian Jeff Hodges had the teens read No Small Plans. CAF did a “Design Your Neighborhood” workshop with them, which we do for all the teachers and people who want us to run this workshop. Those teens developed a five-minute video of Englewood and the way they see it and the ways they think it could be improved and what they love about their neighborhood. It is not anything like the picture of Englewood that you get when you see the news. Getting to see what they think makes a livable neighborhood from the residents in a neighborhood that’s really vilified in the media was so profound. Those are the kinds of projects that are unfolding using No Small Plans as a catalyst. The other thing that’s happening for CAF is that we run this workshop called “Design Your Neighborhood.” We’ve now done them now with 1,500, maybe 2,000 young people about what they think makes a good neighborhood. Depending on where you live you have very different ideas about what makes a good neighborhood and what the building blocks of a neighborhood are. Over the next couple months, I really want to figure out how we can amplify what we’re hearing and seeing from students, and really try to raise that up so that we can have a citywide conversation about what makes a good neighborhood. Plus there’s people buying the book for college classes, reading it in their ninth-grade human geography class in Denver. Baltimore wants to do a novel like this. 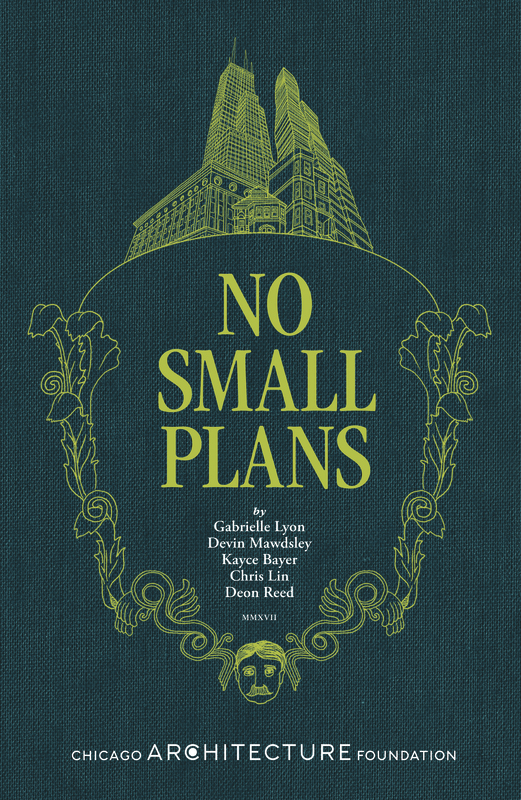 That’s been very exciting, because No Small Plans is set in Chicago, but if you’re living in a city, these are your stories.